It's been almost two months since I had the honor of photographing the sweetest proposal for Hunter and Cami back in March! This day was the most beautiful and it could not have happened more perfectly for the two of them. It all started with one of Cami's best friends calling me and telling me that Hunter was planning on proposing to Cami and wanted to know if I could photograph their special evening. All I had to say was HECK YES and we worked out the plan to make it happen. Some of Cami's roommates and best friends set up a beautiful arrangement of candles, flowers, and long stemmed roses with handwritten notes from Hunter to Cami attached to them alongside a dock at Clemson. The roses were the sweetest with Hunter's notes describing all the things that he loves most about Cami. There was so much thought and time put into making the evening perfect by Hunter and Cami's friends, which made everything even more special. Hunter and Cami went to dinner in Clemson for what Cami thought was just a special date night. Since it was so pretty outside, Hunter brought Cami to the dock and when they showed up, Cami was so surprised to see the beautiful set up. 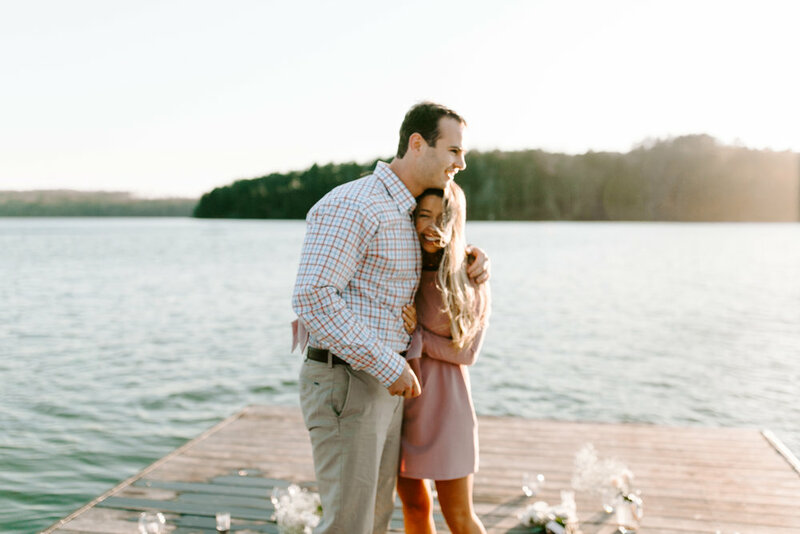 As Hunter walked her down the dock, handing her the roses with the sweet words he had written on them, there were lots of tears and smiles and laughs. At the end of the dock, Hunter got down on one knee and asked Cami to be his forever! It was the sweetest, most joy filled evening and even more fun since Cami was surprised! I'm so happy to have been a small part of their proposal and to have captured the sweetest memory for them. These two are just the kindest couple and as beautiful on the inside as the outside. I wish Hunter and Cami all the joy and blessings in this engagement season and in their future marriage!